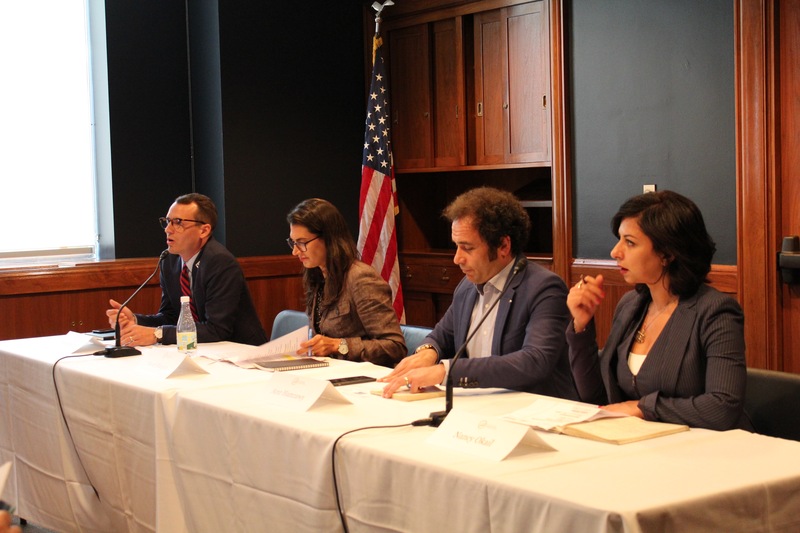 On June 22, 2016, the Robert F. Kennedy Center for Justice and Human Rights (RFK) and the Tahrir Institute for Middle East Policy (TIMEP) cohosted a panel discussion entitled “Egypt’s Renewed Crackdown: The Struggle for Human Rights and Civil Society,” examining the Egyptian government’s repression of civil society and human rights and connection to the country’s stability. Panelists included Dr. Amr Hamzawy, a visiting scholar at Stanford University, Sarah Margon, the Washington Director of Human Rights Watch, and Dr. Nancy Okail, the Executive Director of TIMEP. The briefing was moderated by Wade McMullen, the Managing Attorney of RFK. Mr. McMullen opened the event with a brief introduction citing present-day Egypt as one of the worst periods in the country’s history as far as human rights and civil society are concerned. Ms. Margon elaborated on this view, arguing that the combination of a fledgling economy, young people’s unrealized political aspirations, repressive laws, and overcrowded prisons are contributing to the country’s decline and provide evidence that Egypt is not on a path toward democracy. Dr. Hamzawy echoed Ms. Margon’s concerns, stating that contrary to the regime’s claims that repressive measures have made Egypt safe, the government’s actions have instead worsened the country’s security situation. According to Dr. Hamzawy, the language in Egyptian laws is vague and empowers the government to bring people to trial without any explanation. Once in custody, many citizens are imprisoned over trumped up charges, subjected to torture, and at times even killed. Dr. Okail echoed these concerns and argued that these actions plays into the aims of violent extremists, who appeal to the population’s political needs and know how to address Egyptians’ grievances. The result has been a substantial increase in violence across the country. The panelists agreed that Egypt’s crackdown on civil society and human rights, peddled as necessary in making the country safe, have instead achieved the opposite and led to increased violence, the collapse of the Egyptian political space, and the state’s increasing deterioration. The audience raised questions over the severity of Egyptian President Abdel-Fattah El Sisi’s crackdown in comparison to that of prior regimes. Others posed questions on the treatment of the country’s academics, the degree of crackdown on members of state institutions, and role of the judiciary in the ongoing NGO trial.